After previously battling White Line Disease for five long years, Banixx became available for White Line Disease treatment. Now, this foot has been disease-free for seven solid years! It came out of the blue! My ever-sound 16-year-old competition horse was slightly “off”. We looked at all aspects and then … his feet..! …As the farrier removed the shoe, it was revealed! In the white line area there was no solid line, but copious amounts of a cream-colored dry, crumbly hoof horn. That was it! In just one foot. The farrier inserted a shoeing nail into the white line area and it disappeared into his foot. A subsequent x-ray (strongly recommended) revealed a cavity that extended up to his coronary band (X-ray is recommended to determine the extent of the disease. The infection generally starts at the sole level and works its way up through the foot. As it progresses upward, it leaves behind it a void, a chasm of disconnected tissue that threatens hoof stability). Surprisingly, lameness often does not accompany white line disease which makes vigilance in hoof wall health ever more important. White line disease seems to be more common in an abnormal hoof or where some mechanical stress has occurred. My horse had one clubby foot and over a course of 28 years, that was the only foot ever affected. 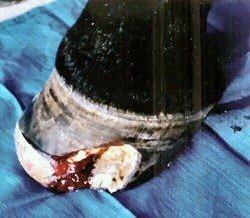 The “invader” is an opportunistic bacteria and/or fungi that gain access to the interior hoof tissue. This invasion results in a destruction of the internal hoof tissue so that the integrity/inner support of the foot is seriously compromised. Untreated white line disease will result in coffin bone rotation. For my horse, after 5 long years without success, he was then resected for the final time. The difference in this final resection was the application of a solid antibacterial/antifungal solution -specifically, Banixx Wound & Hoof Care. As the final treatment for white line disease, the Banixx solution was administered via a medicine boot. He stood in this solution for an hour or so, twice a day for 3-4 days, every time he was trimmed. It has now been 8 years… with no recurrence. After fighting white line disease for over 5 years, I thought this day would never come. And yes, my horse returned to active work!! Barn hygiene, shod or unshod feet, pony or horse, working animal or pasture ornament — none of these factors have, to date, indicated any propensity toward white line disease. 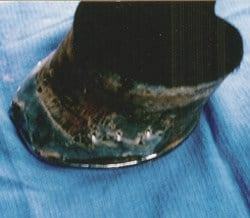 Treatment for this case: After successful debridement (removal of diseased hoof tissue) almost up to the coronet (see photo at left), Banixx was applied using approximately 3-4 ounces in a medicine boot, every evening and each morning. So the hoof was awash in Banixx for up to an hour twice each day. This allowed Banixx to kill bacteria and fungus that was present while the medicine boot kept the foot in a clean environment during healthy hoof wall growth. In between treatments, the hoof was well wrapped to keep it clean. If the wrap comes off between treatments, clean the hoof with plain water and pat it dry before applying the rest of the treatment of Banixx. When the hoof produced enough solid growth to safely retain a shoe, he was shod with a regular shoe (photo on right). White Line Disease (onychomycosis) is an infection of the hoof wall of horses. Treatment for White Line Disease includes removal of the outer hoof wall to expose the infected area and removal of the damaged tissue (debridement). Regular application of Banixx to the debrided foot supports healing and tissue growth.